Using fun rhyming words and whimsical illustrations, Too Many Dogs tells the tale of an overabundance of dogs struggling to live peacefully in a small house. Inspired by a true story, Karen teamed up with illustrator Jen Griggs Sebastian to help kids understand the importance of responsible pet ownership. 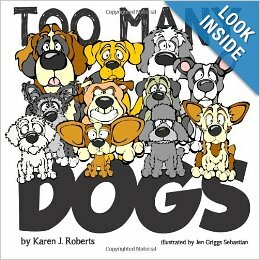 Author Karen J. Roberts uses her experiences as a pet owner, an animal rights advocate and a volunteer in the rescue community for inspiration. Her children’s books promote responsible pet ownership and compassion for animals with elements of kindness and friendship. The Little Blue Dogma, Karen’s first venture into non-fiction, was inspired by countless experiences with animal rescue groups struggling to help the over abundance of dogs in need. Karen lives in Wellington, Florida, sharing her peaceful life with her 5 dogs, and 1 cat. She has her BA degree in English from Syracuse University.